Registration: On-line Registration or Mail-In Registration now available. Conference Promotional Material: We welcome your support in promoting the conference. Please click here to download a handout to share with your clientele. Exhibiting Dates: September 28 and 29, 2018 from 1155 to 15:00 hrs. A Welcome Reception will also take place the evening of September 27 from 1900 to 2100rs for exhibitors and delegates to attend. Exhibiting Fees: The early bird rate is $2,500 and after July 6, 2018 is $2,800. The charge for general booth space was determined in collaboration with the 2018 Ontario Provincial Exhibitor's Advisory Committee (OPEAC) executive in consideration of hotel costs, OPEAC feedback, ORNAO's finances and conference budgeting. Exhibit Booth Sizes: The booth measures 10 feet deep x 10 feet wide x 10 feet high in the exhibit hall and 8 feet deep x 10 feet wide x 10 feet high in the foyer (booths 1-12). Booth includes 1 electrical drop, 1 6' skirted table, 2 side chairs, 1 waste basket, 1 company name sign (7"x44" text only), 1 electrical outlet, booth drape and skirt colour is BLACK. For additional booth or AV services, please see the Show Supplier Services section below. Maximum of 2 exhibitor representatives per booth. Each representative will receive a company badge for the exhibit hall that is interchangeable amongst representatives. Badges will be issued at exhibitor registration on September 27-29, 2018. 2 lunch tickets for Friday, September 28 and Saturday, September 29. 2 ORNAO/All Exhibitors' Dinner Gala tickets on Friday, September 28. Cancellation / Refund Policy: Please note that all cancellation or refund requests must be made in writing to the Exhibitor or Conference Chair. A full refund, less a $200.00 administration fee, will be available until August 27, 2018. NO refunds will be issued after that date. Booth Floor Plan: Click here to view the latest Floor Plan. Booth Purchase: No booth allocation will be considered confirmed until payment in full has been received by ORNAO Provincial Conference. Approval of OPEAC will be required if any company requests greater than six (5) booth spaces. Approval will be determined on space availability. Booth Allocation: Is determined on a first come basis, provided payment in full has been received by the ORNAO Provincial Conference. Exhibitors have the opportunity to select preferred booth locations. However, in order to establish a reasonable balance between competitive companies throughout the exhibit area, the final decision on allocation of booth spaces will rest with OPEAC and the exhibitor committee. Thursday, September 27, 2018 Welcome Reception: Cash bar and hors d'oeuvres for Exhibitors and Delegates from 1900-2100hrs. Friday, September 28, 2018 ORNAO/All Exhibitor's Dinner Gala: Cocktail reception (cash bar) starting at 1800hrs followed by dinner from 1830-2300hrs. Black and white is the theme of the evening. Two tickets are included per booth purchased. Further tickets will only be released once all delegates' tickets are issued. ANY COMPANY THAT WILL NOT BE USING THE TWO ALLOTTED TICKETS IS ASKED TO INFORM ORNAO AS SOON AS POSSIBLE. Saturday, September 29, 2018 Ontario Provincial Exhibitors Advisory Committee (OPEAC) Meeting: A meeting for Exhibitors will take place from 1000-1100hrs. Please request at least one of your representatives to attend his very important meeting. The agenda will be given out prior to the meeting so come prepared to contribute feedback. Please also give thought to electing a representative to fill any vacant positions on OPEAC. Present members of OPEAC are Neal Martin, President, AMT Electrosurgery and Nancy Hopkins, 3M. Saturday, September 29, 2018 ORNAO Dinner: We are hosting a reception and dinner starting at 1800hrs. You are welcome to bring as many Exhibitor representatives as desired. Companies hosting hospitality events are asked to conduct themselves in a manner that conforms to the hotel's security policies. Booth set-up starts on Thursday, September 27 from 2100hrs to 0100hrs on Friday, September 28 and again on Friday, September 28 from 0600hrs to 0900hrs. Exceptions to setup after hours early Friday morning may be permitted upon request only. Exhibit booth displays (assembly and display layout) must be in place by 0900hrs on Friday, September 28. Minor revisions only (e.g. re-organization) and some product distribution may be completed in a one hour time slot just prior to the opening of the exhibits. Any exception to this must have prior approval of OPEAC and Exhibitor Chair. Exhibit hours run September 28 1155-1500hrs and September 29 from 1200 to 1500hrs. No exhibit may be dismantled prior to the official closing of the exhibits. Dismantling of exhibits must be completed by 2000 hours on Saturday, September 29. Admission to all functions, including the exhibit area, will be by badge only. Obstruction of delegate's name tag by the use of stick-ons and handouts will not be permitted. An exhibitor, his employees and guests are not permitted to obstruct or otherwise disrupt the normal function of a fellow exhibitor. Failure to comply could result in suspension of the right to exhibit at future meetings. All demonstrations, or other sales activities must be confined to the limits of the exhibiting company's exhibit booth. No exhibitor shall assign, sublet or apportion the whole or part of the space allotted without knowledge or consent of the Planning Committee. Aisles must be kept clear and exhibits shall be arranged to ensure exhibiting personnel remain inside the space rented. The planning committee respectfully requests that no commercially sponsored function is planned that will conflict with conference activities. A fee of $100.00 will be charged for use of the ORNAO Logo on any conference material. Prior approval must be obtained from the ORNAO Conference Planning Committee. Use of the ORNAC Logo requires approval from the ORNAC Executive. ** A copy of the specific hotel and/or convention centre rules & regulations for exhibits and hospitality suites will be made available to participating companies through this web site, see Conference Main Page (Brookstreet Hotel in Kanata, Ontario) and Directions or on request. Booth Shipments and Storage: Please note that Brookstreet is not equipped to receive or store shipments. Freeman Transportation has been appointed as the official carrier to receive, store and deliver shipments to your booth. 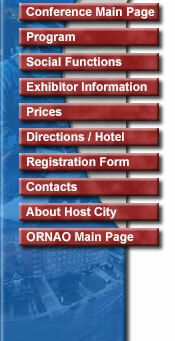 Contact: exhibittrans.canada@freemanco.com or 1-877-478-1113.